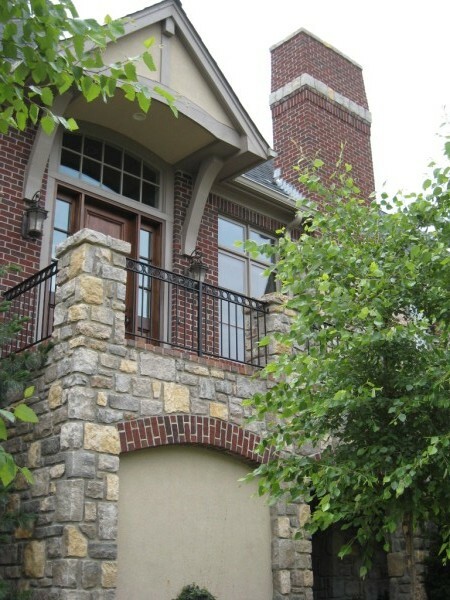 Increase your home's value with stone or brick masonry from Brotherton Masonry, Inc. serving the Kansas City Metro area. Kansas City Masonry Contractor, Dan Brotherton, owner of Brotherton Masonry, has more than 26 years of masonry experience and guarantees your satisfaction. Contact us today for work in the Kansas City Metro Area at (816) 690-7685. We do Brick and Stone Veneers, Patios, Fireplaces, Chimneys, Retaining Walls, Steps, Sidewalks, Thin Stone, Thin Brick, Cultured Stone, Stone Flooring, Brick and Stone Entrys, Columns, Arches, Tuckpointing, Outdoor Grills and Outdoor Fireplaces. Some of Our Work Featured in newspapers and the Kansas City Homes and Garden magazine. Stonework is virtually maintenance free and adds beauty and value to your home at the same time! There are so many options to choose from when it comes to stone and we can help you make the right choice to give your home that natural or upscale look, whatever you're looking for! Brotherton Masonry, Inc.'s stonemasons (and the rest of the crew) are clean-cut and trustworthy, so that homeowners would feel comfortable having them working on their masonry project outside or inside their home. Brickwork can look classy, rustic, old-fashioned, or even formal! Better known for its old world appeal that never goes out of style, and with all the brick options to choose from, you're sure to find something that fits your needs and that enhances the beauty of your home! Kansas City Masonry Contractor, Dan Brotherton, brickmasons, and crew are clean-cut and trustworthy, so that homeowners feel comfortable having them work on their masonry projects inside or outside of their homes. Reveals a few tips before you start your stone or brick masonry project! ​​We have MORE steps, strategies, and tips that can SAVE you time, $, and frustrations! What one thing you MUST consider concerning your existing landscaping that could save you YEARS of frustration! How to SAVE money by choosing the right mason! And, why you should NEVER choose a brick or stone masonry contractor based on estimate alone! How thick SHOULD your stone veneer be to last a LIFETIME! The number ONE reason you should NEVER use a non-mason to lay thin stone! Why you should NOT try to match masonry that was installed over twenty years ago and what you SHOULD do instead! When it's BEST to lay stonework from the top down! "Our entire experience with Brotherton Masonry in refacing an outdoor fireplace was exceptional. In a day when service is oftentimes lacking, Brotherton called when they said they would call, showed up when they said they would show up, delivered an exceptional product, and cleaned up the entire work area before they considered the job complete. It all started when Dan consulted with us before the project and provided us the insight we needed to proceed. Thank you!" "Thanks for the great job!!! If you need anything like references let me know. Thanks." "I really appreciate working with you on this and the way you took care of my concerns. It is not hard to see why Sturgis recommends you so highly. Thanks for a great job. I hope you have a safe and happy and prosperous New Year." "Thanks so much for doing the stairs. We'll look forward to using them! "Dan provided a clear, detailed work estimate. His crew began work as planned, worked in difficult confined areas needing repair in a historical home, & neatly cleaned up all construction debris. We appreciate all aspects of service he & his workers provided." ​​"Thank you so much for getting us worked in. After the mortar dried you can't tell the fireplace was ever altered and your guys did such a wonderful job of making sure the work site was clean. Thanks for such a professional job." "Dan, Thank you for taking care of my chimney needs! I truly appreciate how fabulous you and your team are to work with. Again, thank you!" "I just wanted to make sure I let you know how very pleased I am with the work your son did yesterday. I know he was worn out when he left, but he made sure everything was perfect! I appreciate such a great job!" "I appreciate your quick response as well as your professional business ethics." "Thank you very much! The steps look great! Happy holidays"
Thank you so much for all your great brickwork done at our home these past few days. We will gladly refer you to future customers!" ​I will certainly recommend your company to any of my friends and family. Thanks for the beautiful work and have a great day!" "I appreciate your​​ quick response in giving me a proposal and scheduling my chimney repair. The chimney looks very nice since it was cleaned, cracks were filled and it was sealed. "Just a note to let you know we appreciate your help!! The stone work looks so awesome. We love it lots.